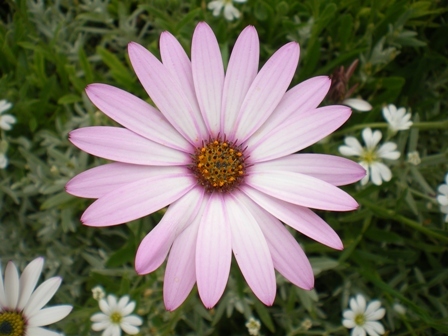 This osteospurmum never fails to come out every year, even though, again, it is listed as frost hardy. Beware of any other cultivated types: they will definitely die in the frost! And just look at those colours. Ain't nature grand?! I love alchemilla mollis for its haze of frothy lime green flowers. Lime green flowers and plants lift other garden plants to a new level: the colour offsets reds, and pinks and purples of all shades, beautifully. Alchemilla mollis, or 'Lady's Mantle', as it's often called, does the job brilliantly. It zings out and brings the other colours alive. And it's invaluable in cut flower arrangements for the same reason. Because it seeds very freely, the secret is to pull out the little seedlings when they are tiny, and either replant elsewhere or throw away. Cut spent blooms carefully to stop seeds spreading. When the leaves begin to fade, cut right down to the base (you can even strim them if they are growing along a path), and they will pop up again, all fresh and bright. Heuchera is another plant that can provide a valuable lime green colour: this time with its foliage, although there are lots of leaf colours available for this plant species. Here is the deep maroon one nestled under taller border planting. There are some vibrant leaf coloured varieties of heuchera. I'm particularly fond of the heuchera 'Lime Marmalade' and another called heuchera 'Key Lime Pie' for their wonderful zingy lime green foliage. Heuchera are classed as semi-evergreen perennials and so their leaves will stay around for much of the year. Their bold form and colour are their main attraction rather than the flowers they produce, although the traditional heuchera has rather uninspiring foliage with beautiful, deep coral pink spires. The beautiful penstemons! What a wonderful bunch they are. These plants are also classed as frost hardy, although they are, in actual fact, pretty resilient. I've included them here because I wouldn't be without them in my garden and they have survived every year apart from the aforementioned severe winter! We've seen several of these when looking at other plant pictures, but here's a reminder. 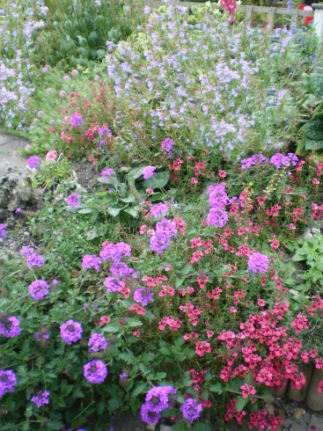 In the top right of the picture below is the lovely penstemon 'Heavenly Blue', planted on a rockery border with the fabulous pink diascia and purple verbena. The latter two are bedding plants (annuals) that will more than likely not survive the winter (although these did last for three years). 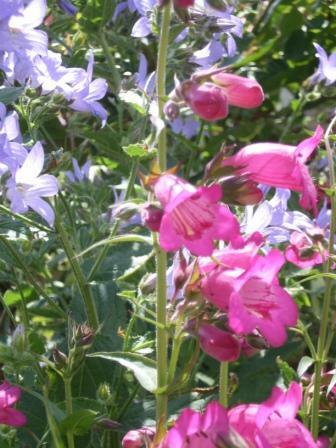 If you are concerned about your penstemon suffering from frost damage, try piling a mulch of bark chippings on the crown of the plant. When the weather turns warmer in spring, remove the mulch to prevent rotting. There are lots of different colours, sizes and forms of penstemaon to choose from. Keep a look out in your local garden centre for bargains. I can buy four of these stunning plants for a tenner, so if I lose one, it isn't too costly to replace! Can't be bad. 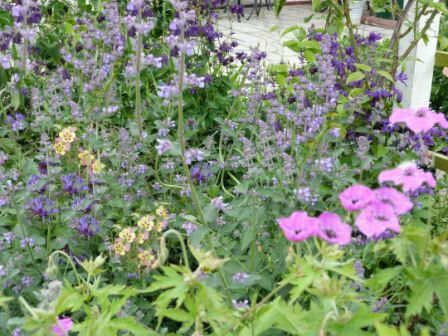 We saw the low-growing nepeta before, intermingling with the geraniums. Like the alchemilla mollis flowers, the nepeta adds an ethereal quality to a border, showing off the more sturdy plants to greater effect. 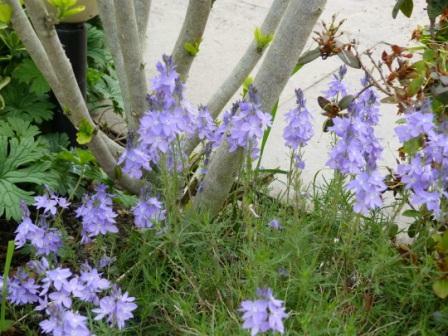 With foamy violet spires, grey-green leaves and a lovely scent, it is a really useful border and rockery plant. Here is another variety called nepeta 'Six Hill's Giant': and it really is a giant! It blends well, in this border, with the deeper purple of the aquilegia, the magenta pink of geranium psilostemon (a magnificent, very tall, extremely long-flowering variety) and the purple and yellow aquilegia. I adore the delicate flower colour, the smell and the grey-green foliage, which blends so well with any pink, purple and white colour scheme. With spires of the deepest purple through to pale violet, rose and pale- pink, salvias provide a useful splash of colour at the front of a garden border. Plant several together to form drifts of vibrant colour. 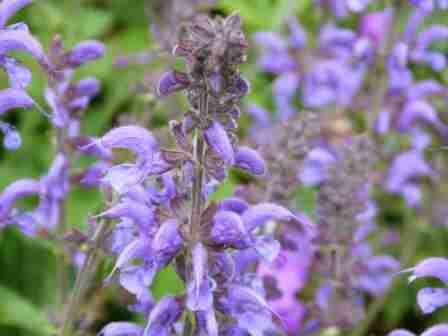 When buying salvias, make sure that they are the hardy variety, as some of the more electric blue ones are definitely not, and will die at the first sign of frost. 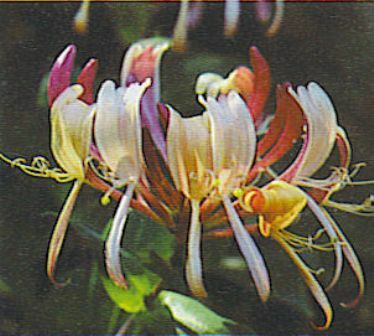 Team with strong or pale pinks, cream, yellow and white, or against dark and lime green foliage. These are lovely, spongy pincushions, bearing delicate flowers, usually in pink, cream and yellow. 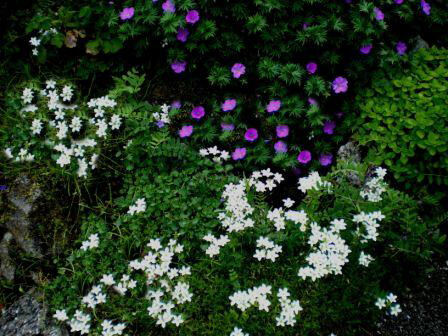 One of my favourites is the cream saxifrage, as it is more vigorous than the others, happily scrambling over a rockery or the edge of a border quite quickly. 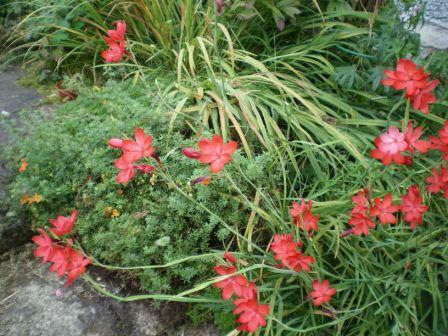 Here we see it growing with geranium sanguineum, in a rockery border. You can tell it's evening, as the geranium is really luminescent. Saxifrage is really easy to grow and to propogate. 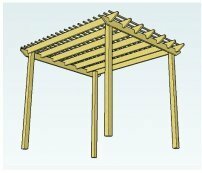 If you would like it in another part of the garden, just pick up a section (it's a bit like a mat) and lay it on the ground to re-root. Simple. One word of caution; if you have a cat, these plants make an extremely cosy bed! What a gorgeous colour it is! This type of veronica will more or less look after itself, unlike the taller varieties, whose spires tend to fall over in the wind. 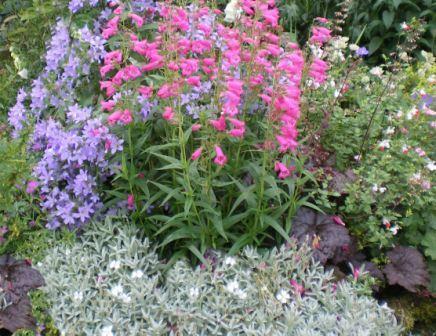 It's great for rockeries and the edge of borders. Small, yet very beautiful. Often called the kaffir lily, both the sugar pink and deep, coral pink varieties give a dash of lovely autumn colour. 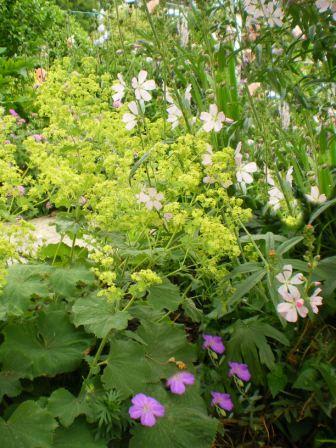 Plant next to other strong foliage plants to help support the long, delicate stems, or let them find their own way, as they are doing in this border. 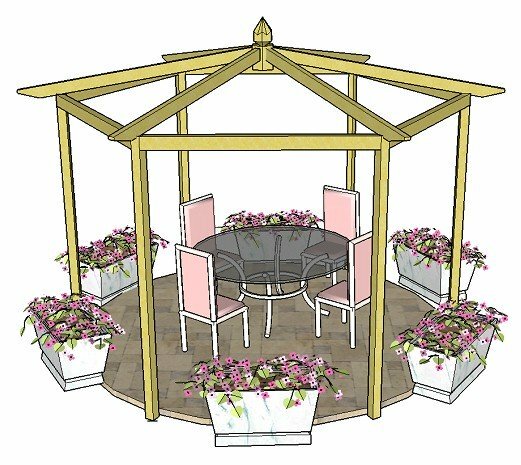 A very fragrant, indestructible climbing plant that bears beautifully coloured saucers of delicate petals on twining stems. 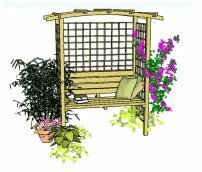 These vigorous plants will soon cover a wall, fence, arch or pergola in no time at all. The fragrance is the outstanding feature, so plant near to where you walk, or sit, in the garden.